After recent mass shootings, anti-gun control advocates have called for the elimination of “gun free zones” and letting more people carry guns in more places. They argue that the path to fewer shootings is through giving more people the ability to shoot back at a shooter and the theory that this will act as a deterrent. By the logic of the gun activists, shootings in schools can be averted by giving teachers guns and shootings in movie theaters can be averted through letting ticketholders carry their weapons to the show. In fact, some such activists have gone as far as to blame gun-free zones for shootings because they think that shooters are assured not to meet armed resistance. Statistically, mass shooters tend to be disturbed individuals who plan on taking their own lives or going out in a hail of police bullets—they don’t care about dying, thus are unlikely to be deterred by the potential that they will be shot at. Contrary to what many gun extremists claim, shootings do happen in places where there are guns (ex. Fort Hood had armed guards, Virginia Tech had a SWAT team, and Columbine had an in-school police officer). If a shooter starts a rampage in an area with multiple armed individuals, there is a very real danger of a cross-fire, with multiple shooters all thinking that they are shooting at the original aggressor while spraying gunfire at everything that moves—this danger is why ALL gun shows have strict policies mandating that all guns be unloaded and safetied while on the premises. “Now, we must speak … for the safety of our nation’s children. Because for all the noise and anger directed at us over the past week, no one — nobody — has addressed the most important, pressing and immediate question we face: How do we protect our children right now, starting today, in a way that we know works? The gist of LaPierre’s statement mirrors the sentiment of hundreds of current anti-gun control activists. 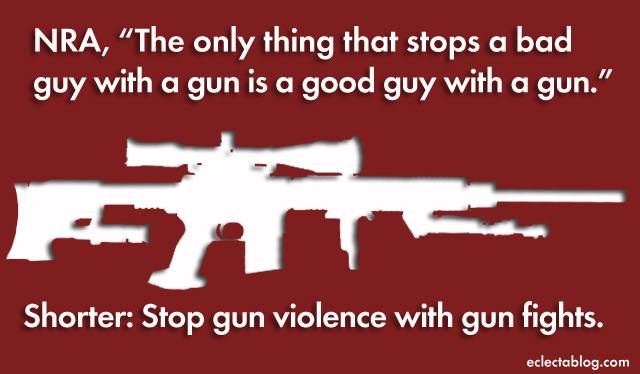 That said, this sentiment is a relatively new development in a long argument over gun control. Just a decade ago, even extreme gun activists avoided calling for schools to be flooded with weapons out of fear that they would be too far away from the mainstream. It may surprise people who have only started paying attention to gun policy, but this activist was Wayne LaPierre and his organization was the NRA. When LaPierre decries people who supported the passage of gun-free laws and blames them for modern mass shootings, he is talking about himself and hoping that people don’t look up his past positions. During the 14 years between Columbine and Newtown, what changed in the NRA and society that caused this shift away from gun-free schools? Put simply, gun debates got more extreme and shifted farther in favor of the gun-absolutist position. This shift has allowed the NRA to take positions which would never have been tolerated in past decades. In 1999, the NRA was doing damage control after Columbine and wanted to mitigate any significant legislation cutting back on guns—in order to do this, they threw their weight behind banning guns in certain vulnerable places rather than restricting the production and sale of the weapons themselves. By restricting where the weapons could be carried rather than the sale or production of the weapons, the NRA shielded its gun manufacturer funders from losses in sales but still gave the public a much needed focus for their anger and motivation to stop the next shooting. If they had suggested that teachers and other civilians should be armed in 1999, they would be so far away from public opinion and common sense that they would have marginalized themselves. Since 1999, the NRA has become even more successful and bold–gun laws are weaker than in 1999 (ex. the assault weapons ban expiring) and the NRA has a stranglehold on the heart of the GOP. Over these years, the NRA has shifted the debate farther and farther over to the side of gun anarchy by winning on the state level and obstructing any increase in gun control on the federal level. In addition to shifting policy, society has become more inured to shootings than in past decades. We have simply had so many shootings and so many massacres that large portions of the population have become demobilized. School shootings happen at such a frequency that they no longer hold the public eye unless they have a significant body count or involve very young children. The success of the gun extremists and the complacency of the public has allowed corporate shills in the top ranks of the gun lobby to mobilize their extremists and suggest extreme policy without worrying about repercussions—in fact, the NRA leadership now pushes things that 70%+ of their own members do not support (ex. allowing people on the terrorist watch list to buy guns). Ideas that would have been met with incredulous laughter in 1999 are now taken as legitimate policy suggestions and society is feeling the consequences. 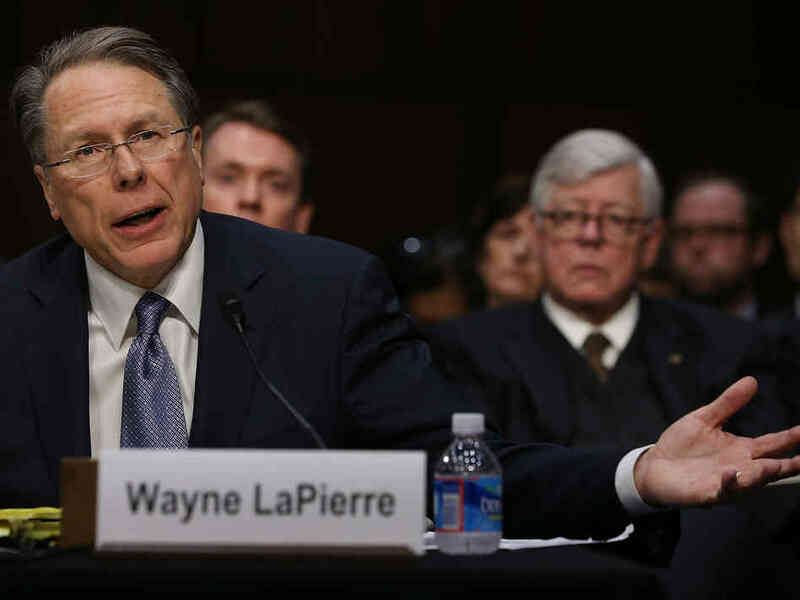 While Wayne LaPierre will likely never answer the previously mentioned question, his actions speak for themselves. In 1999, LaPierre supported the most pro-gun policy that he thought could pass, then spent the time after the outrage subsided moving the goalpost. Today, LaPierre is doing the same thing that he did back then—supporting the most pro-gun policy that is feasible—and is lying about the dangers of gun-free zones because he has pushed the goalposts far enough that gun-free zones are no longer his fallback. 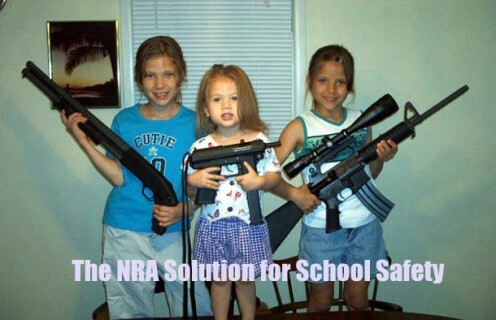 If this trend continues, 14 years down the road, we may very well see LaPierre or his successor decrying the evils of just letting teachers carry guns and supporting the freedom of grade school students to own and carry firearms for self-defense in schools. Fortunately, people on the pro-gun control side of the debate are working to prevent the next massacre, thus there is hope that the goalposts will begin to shift back towards a sane gun policy. If this happens, one can only hope that people like LaPierre will fall into irrelevance as the public begins to see how extreme they have become. So in show of solidarity is Mike Bloomberg gonna give up his armed bodyguards as well? Mass shooters do tend to be disturbed individuals who may not be afraid of dying. All the more reason to neutralize them as quickly as possible. Trained armed citizens are ideal for this purpose and unlike uniformed police officers, may already be on site and won’t be perceived by the mass shooter as an immediate threat. You used the examples of Columbine, Virginia Tech and Fort Hood. I would encourage you to view what Wikipedia has compiled regarding school shootings in the U.S. since the very first known reported incident of a school shooting on July 26, 1764 in Greencastle, Pennsylvania (27 years before the Second Amendment). Clearly, mass shooters/murderers DO prefer locations where it is unlikely that they will be met with armed resistance. Could you please provide a listing of incidents that you have found in which multiple, law abiding, armed citizens have confronted an armed criminal and started a cross fire “spraying gunfire at everything that moves?” I do not recall any such incidents. However, there is more than one incident in which police officers have discharged excessive amounts of rounds in situations where it was not necessary. The incident in Times Square on September 14th of this year in which the suspect was perceived to be armed, but was not and resulted in two innocent, female bystanders being shot by the NYPD stands out in particular. I wish to make it clear that I support law enforcement and I am in no way attempting to discredit the NYPD. I am just making a reference to the incident. It is obvious that you do not attend very many gun shows. The reason why gun shows require that all guns being brought onto the premises be unloaded is because those guns are being brought there for the purpose of being sold or traded. A perspective buyer will want to HANDLE and inspect the gun prior to purchasing it. This will likely involve testing the action and trigger pull and looking down the barrel and checking the sights and does not require live ammunition. The gun may be handled by multiple buyers. Due to the ranting of gun control fanatics, gun shows are usually VERY crowded and patrons are literally shoulder to shoulder. 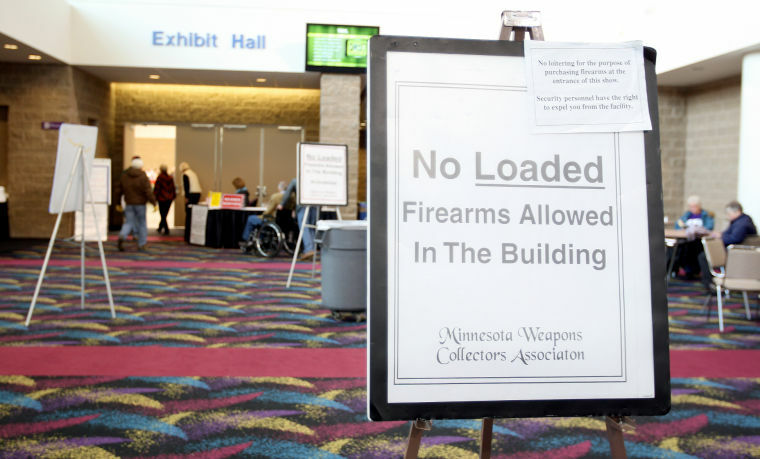 It is just common sense to ensure that all guns being brought to the show for sale be unloaded to prevent ACCIDENTS. This has NOTHING to due with preventing a crossfire. “The gist of LaPierre’s statement mirrors the sentiments of hundreds of current anti gun control activists?” I think you must have meant to say TENS OF MILLIONS of anti gun control activists. It seems that you have finally at least acknowledged that society has began to “shift away from gun-free schools” and that the debate has shifted in favor of “the gun-absolutists position.” We may get you on our side yet. If this “trend” continues, 14 years down the road, we may very well see Wayne LaPierre or his successor in the White House. Changing one’s opinion is not proof of being “bipolar”. I find it interesting that you mentioned the terrorist watch list in this article. On September 2nd of this year, you posted an article in which you accused the NYPD of “illegally” spying on mosques in NYC “based on nothing but bigotry”. Do you not think that it could be possible that the U.S. government may have placed a significant number of individuals on the terrorist watch list simply because they may just have an Arabic sounding name, may be a devout Muslim or because they travel frequently to and from the Middle East and may have no actual ties to terrorist organizations? How does that justify denying them their Constitutional rights if they are law abiding U.S. citizens? I’ll wager that if the government suddenly announced that no one on the terrorist watch list could own a personal computer with internet access that you would be furious. This is not why guns shows have the policy of unloading all guns. It is to eliminate the chance of an accidental discharge while firearms are handles in the crowded shows. Your conclusions are emotional and mean nothing. Your evidence against the ” gun extremist’s ” argument against gun free zones is false. 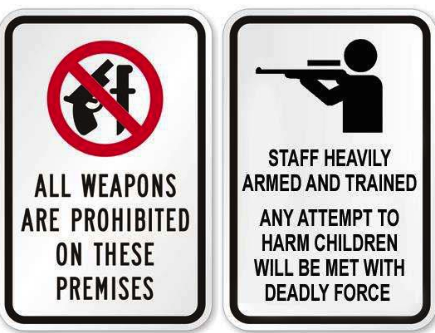 Fort Hood just like all military bases are also gun free zones meaning a permit holder cannot carry. Also, the only armed guards were at the entrance/exit gates of the base. No one else is armed on base. Virginia Tech had a swat team as a reactionary measure. Meaning they were not there to stop the threat. Same definition for police officers. They are a reaction force, not a pro action force.